Outdoor lighting not only provides safety and security for your home by illuminating pathways and your driveway after the sun goes down, but it can also create attractive and dramatic effects in your nighttime landscape. As long as the areas where you want to place outdoor lighting fixtures receive adequate sunlight during the day, solar lighting is an easy, energy conscious, and inexpensive option. 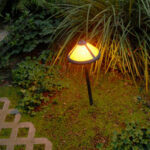 LED outdoor light charges during the day and shines at night. Because solar lighting fixtures don’t require any electrical wiring, they are infinitely easier to install than low-voltage lights. 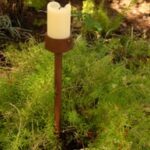 Most simply stake into the ground, allowing you to skip digging trenches for wires and figuring out how to connect the lights to your home’s electrical system. Because they convert sunlight into energy, solar outdoor lights also won’t add to your electrical bill. The one downside to solar lights can be the quality of the light itself; however, most manufacturers now offer lights with LEDs, which have a strong, bright light that should last as long as the fixture itself. In addition to the standard staked light, there are several other options for appearance and application. You can find lights that hang on the wall or out over the walkway, lampposts, or even lighted bricks that work well around pools or other paved areas not conducive to staked lights. For functional rather than decorative lighting, you can install solar-powered floodlights with a motion detector to deter intruders. 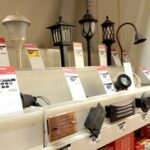 Solar outdoor lights can be found online and at most home improvement stores, and they are relatively inexpensive—simple path lights start at about $10 each. Be sure to check the packaging to find out how long they’ll last after a full day’s charge, and expect that time to decrease during winter months or if the lights are shaded during parts of the day. Also expect it to take a few days after installation until your lights reach their full nighttime output.